As a player, I loved running bases. It’s so super fun to push your limits, make your opponents sweat a little, and take extra bases any time the opportunity arises. Good baserunners give defenses something to think about. They’re always a threat. They make things tough for the opposing defense and add pressure to otherwise “routine” situations and plays. All this distraction on the bases often takes focus off the batter. It can also open up holes for batters to hit through. You give you team more chances to score! Exploding off the base not only disguises actual steal attempts, it gives the defense one more thing to worry about on any given pitch. 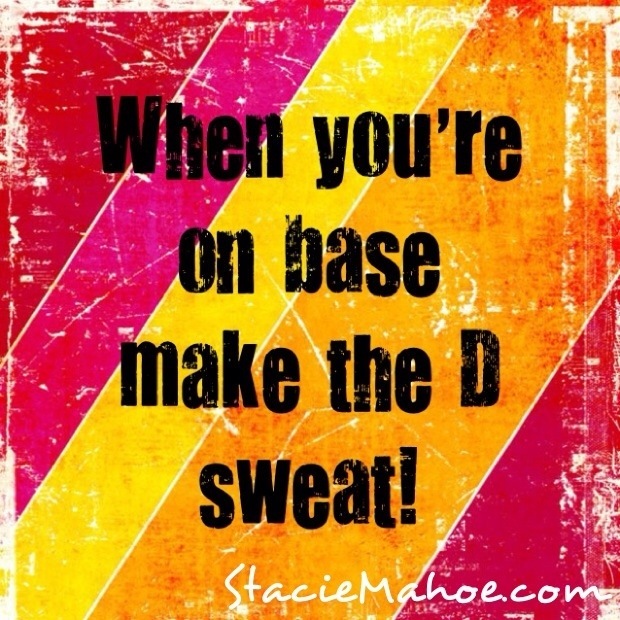 Everyone must stay alert and work to get bases covered. Pressure is on the pitcher not to throw any wild pitches. Pressure is on the catcher not to allow any passed balls. No one can just kick back, relax, and enjoy the feeling of being in complete control. The other benefit of exploding off the bag on every pitch is the great jump start you get if the batter actually hits the ball. That jump could mean the difference between breaking up a double play or allowing the defense to get two outs on a routine ground ball. It could mean the difference between scoring from second or being held up at third. These are BIG differences that YOU can make happen just by taking a good, strong, explosive lead on every-single-pitch. Once you take your explosive lead, you must be in position to get back to the bag safely. This means being just ONE step and a dive away from the base so you can beat any pick off attempts. Get too far away and your aggressiveness off the bag may actually hurt your team instead of help it. For me, taking two hard, fast steps then turning toward home put me in the right position. This is one of the biggest problems I see in lead taking. Players don’t get a good jump. Especially those using the rocker start! The whole point of that style of lead taking is to give you an advantagesby building up your momentum before actually leaving the base instead of starting from a dead stop. But that doesn’t do you ANY good whatsoever if you’re taking your lead too late! If you don’t have the guts to start your lead BEFORE the ball leaves the pitcher’s hand, DO NOT use the rocker start. No matter what style you choose, you CAN get a good jump. The main thing is GOING on time! One of the best ways to figure out if you’re on time or not is have someone video you taking leads in a game (or even in practice). Now days with all the smart phone technology out there, this shouldn’t be difficult. Both you AND the pitcher must be in the video. When you watch it, you should be able to see exactly where you are when the ball comes out of the pitcher’s hand. Slow the video down. Stop it on the frame where the ball is leaving the pitcher’s hand. Make note of where you are. Are you too early? Or too late? Maybe you’re right on time! Remember, if it’s tough to tell whether or not you’re leaving early in slow motion, it’s tough for umpires to make that call too. So don’t panic if sometimes you’re a hair early in slow motion. This is another common mistake baserunners make. They take a nice lead, then have no idea what’s going on with the ball. This is a HUGE problem! If you hear your teammate make contact THEN have to pause, find the ball, and figure out where it is before you make your next move, you just wasted everything you gained by taking that great lead. Plus, you’re dead meat on any line drive because you probably won’t even see the catch! When you take your lead, make sure you take a peek in toward the plate. If the ball looks like it’s heading toward the dirt, either on the way to the plate or after your teammate hits it, GO! Right now! Don’t wait. Don’t hesitate. If you do this right, you will be in continuous motion from the time you start your lead. There will be very little slow down and definitely no complete stop. Whatever you do, once you take that fabulous explosive lead, don’t get lazy! Stay athletic, ready to move either way. Again, NOT doing this can cause your aggressiveness to do more harm than good. A good catcher/pitcher will pick you off the moment you get out of an athletic stance. Even if you’re NOT playing against a good pitcher/catcher, DO NOT get lazy! Stay athletic. Practice good baserunning habits every chance you get. After a while, good habits will become so second nature you won’t even have to think about it anymore. You’ll just be a rockstar baserunner!